The Taoiseach has rejected a suggestion by British Prime Minister Theresa May that the customs arrangements between the US and Canada could be a model for the post-Brexit Irish Border. Mrs May made the remarks as she was challenged by the Labour Party in Westminster to name any international boundary between countries that aren't in a customs union that don't do checks on lorries at the Border. She said the British government is looking at many different arrangements for customs around the world "including for example the border between the United States and Canada". Taoiseach Leo Varadkar was asked about Mrs May's remarks in Dublin at a joint press conference with Xavier Bettel, the prime minister of Luxembourg. He said be hadn't heard her remarks and so couldn't comment directly. But Mr Varadkar added: "I visited the US-Canada border back in August. "I saw a hard Border with physical infrastructure, with customs posts, people in uniforms with arms and dogs.That is definitely not a solution that we can entertain," he said. Mr Bettel said the EU would support Ireland's position on the issue. Mrs May has been criticised for failing to give any more detail on how to avoid a hard Border in Ireland in a major speech last week. 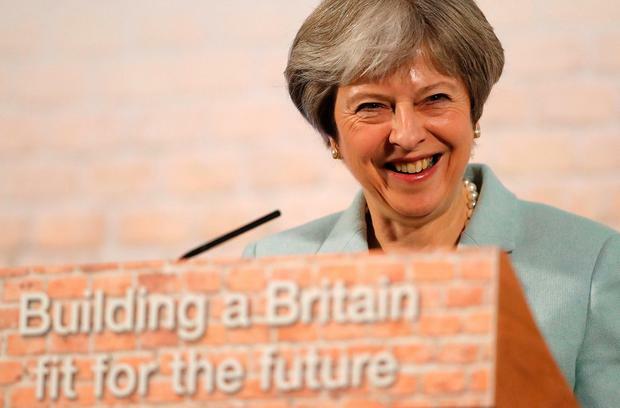 In Westminster yesterday she again reiterated her commitment to avoiding such a Border, but also said the UK could not accept the Border effectively moving to the Irish Sea. This was a reference to EU proposals that would see Northern Ireland remain in a customs union as a so-called 'backstop' arrangement if a comprehensive deal can't be agreed with Britain. Earlier Mr Varadkar ruled out any formal three-way talks between Ireland, the EU and UK on Mrs May's own Brexit proposals. Mrs May had suggested such talks had been agreed to examine the Border issue. But Mr Varadkar told RTÉ Radio that, while consultations may take place on issues unique to the Irish-British relationship, "Ireland is part of the EU 27 and we're much stronger...as one of 27". Finance Minister Paschal Donohoe was in London yesterday for talks with UK Chancellor of the Exchequer Philip Hammond and Cabinet Office minister David Lidington. He said the British ministers reconfirmed their government's commitment to the Good Friday Agreement and to the development of "frictionless Borders". He was asked about the British government's rejection of the 'backstop' option and said such concerns were shared with him during his meetings. But Mr Donohoe said the fall-back position was "critical" for Ireland and added that the issue shows the importance of reaching a comprehensive agreement on the future relationship between the UK and EU. He believes it will be possible to reach such an agreement.